I’ve written about Valentine’s Day a lot in the past week. No matter what your relationship status/budget, I’m pretty sure I’ve covered it: From clueless guys — http://snurl.com/uczq9 — to open-minded folks of either gender — http://snurl.com/uczqt — and cheap women — http://snurl.com/uczrt — to the Nerdy: http://snurl.com/uczsh — and…the Neurotic — http://snurl.com/uczjn. If these ideas sound like too much trouble, I suggest Duncan Hines. I have a friend who used to do PR for Duncan and who needed some photos of some Valentine’s Day recipes last year…which I made and then photographed…and I actually thought most of them were pretty good (except for the giant frosted two-layer, heart-shaped brownies with cherry fluff in the middle. I thought those were a little overkill…). So, I mean, here we are with Valentine’s Day over halfway over and I have not had one single bout of jealous rage. 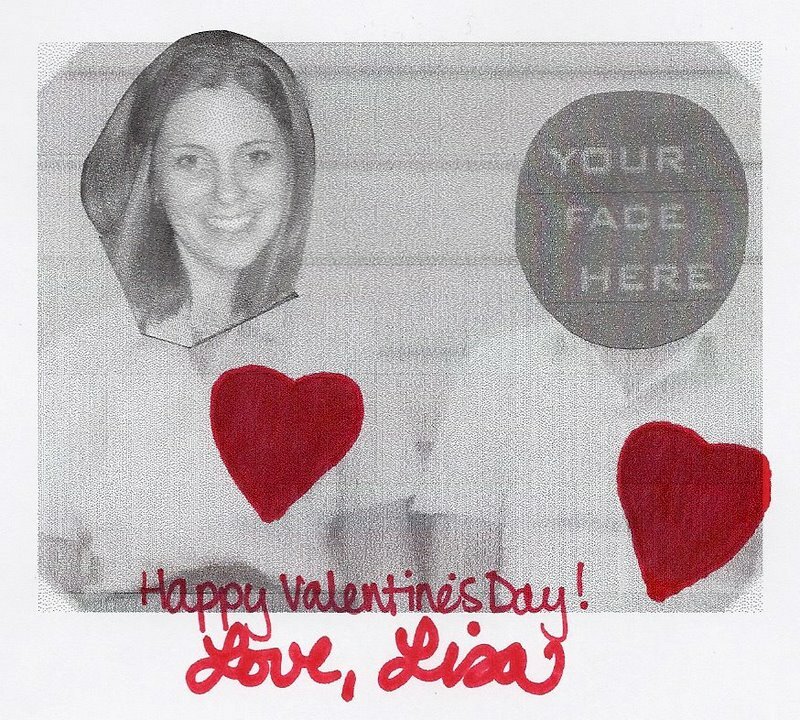 I think it is because of my Valentine’s Day card…which I wrote about — as noted — for the Luxury Spot. The past several years, I’ve tried to anticipate you and come up with a sensible way to counteract you, thereby maybe enjoying – or at least enduring — the Day of Love…but, sadly, nothing has proven particularly effective – not sending cards to my nieces and nephew; not “going out with the girls…”; not baking heart-shaped treats for my coworkers. But I think this year I have finally cracked it! And, I mean, I may be getting cocky again and Monday morning will find me curled up in a ball on my bathroom floor after drinking an entire bottle of pink champagne by myself…but…with 48 hours to go, I’m feeling pretty good about my 2010 Valentine’s Day Plan. But then I grew up and got a job and started going to work on February 14 (or thereabouts)…and walked into offices that looked like veritable florists…and knew, year after year, that the only sign of life on *my* desk would be the countless knickknacks and office supplies that were there 365 days a year…and as much as I’d like to be a big person and to be happy for everyone else, let’s face it – after X goddamn years, it’s hard to grit your teeth and smile and think, “That’s so nice for you! I am happy that you are having a happy Valentine’s Day!” and actually mean it…and not, you know, shoot laserbeams out of your eyes at her while you’re doing it. 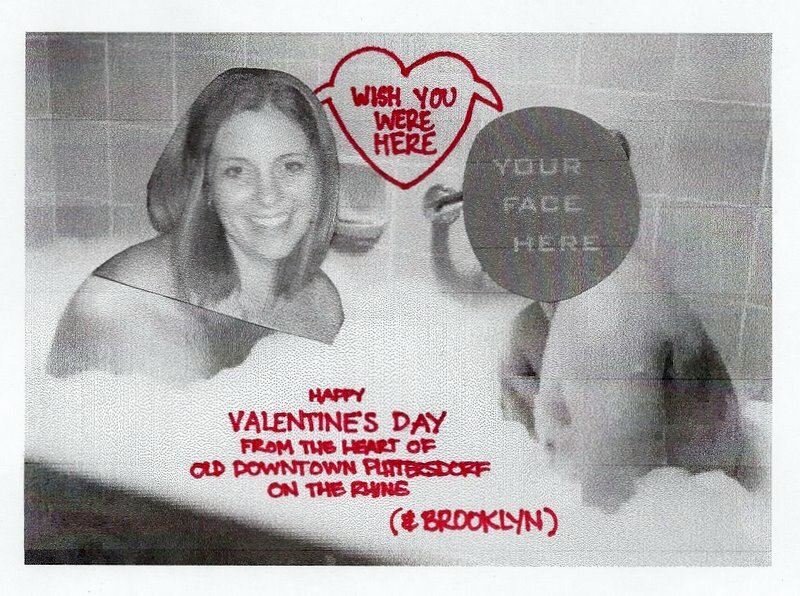 I will never forget the Valentine’s Day I worked for a popular lifestyle magazine in Midtown. I was carefully hidden away in an area adjacent to the conference rooms that was affectionately (…or not so much…) labeled “Intern Alley.” But…it was also remarkably close to the Editor-in-Chief’s office (and, therefore, her assistant). And I found her assistant incredibly intimidating because she was one of those women who was drop-dead gorgeous and had amazing clothes and was super-confident…and, you know, I feel like there’s some justice in the world when women like that are really dumb or trapped in loveless marriages or whatever…but this woman – we’ll call her Genevieve – could speak French. Flawless French. Her phone would ring and she would pick up and fire away en francais as if we were working in Paris or something. So…it was no surprise to me on Valentine’s Day that year when a mail room guy appeared at her desk with a giant box of flowers. “Oh, look! My boyfriend sent me flowers!” Genevieve cooed. And then…merely an hour or two later, another box appeared. “Oh, look! My ex-boyfriend sent me flowers!” she trilled again. I began to quietly seethe in Intern Alley. Because, you see…other than the bouquets my mother bought me when I graduated high school and college (and a bouquet I sent to myself at work once to make a coworker jealous), I have gotten flowers exactly two times before: Once at work after giving my business card to a weird little man at a bar in Jersey City…who sent them with a note that read, “From, Patrick…” and I had no idea who they were from until he began calling my work number obsessively to see if I got them…and while I thought that if I ignored him long enough, he would eventually give up…I had to finally give in and answer the phone and tell him I had a boyfriend to make him go away. So…since the holiday card went over so well, I really wanted to do another one for Valentine’s Day. And while I could get away with using the cat for the holidays, I really didn’t want to firmly establish a precedent. Plus, I mean, it’s Valentine’s Day. I like my cat, but…c’mon. So…a proverbial seed was planted and I began thinking about what I could for Valentine’s Day. And then I don’t know how or when I remembered it, but…at some point last year, I read Julia Child’s “My Life in France.” And…I guess Julia and Paul liked sending out Valentine’s Day cards as there was a whole section in the middle of the book with images of the various valentines they sent out over the years…and there was one in particular in a bathtub that I just loved. And when I remembered it, I really, really, really wanted to use it. The problem, however, is that Paul Child is in the photo. And while I could easily superimpose my head on Julia’s body, I didn’t know how to deal with Paul. So…I started thinking about which men I could use in Paul’s place. In theory, there was Javy…but that seemed a little old and tired. And…I also thought that I could pick a girlfriend and glue *her* face on Paul’s body…but, while potentially empowering again, it seemed a little weird. So…I was stuck…until I remembered Tucker Max. And I don’t really know where it came from in my head as I’ve never read the book or seen the movie…but, seemingly from nowhere, I recalled the movie poster for “I Hope They Serve Beer in Hell,” and the “YOUR FACE HERE,” on the girl’s body. Et, voila. My Valentine’s Day card was born. I’m not going to lie – it would make me pretty happy to wake up on Sunday and find one of these on my doorstep (…but not from a weird little man who lives with his parents in Bayonne and calls obsessively for weeks…)…but, bar that, I think it makes me happy to send these images out into the world and spread a little Valentine’s Day joy. So…see? Maybe I’m not such a bitter Betty after all. I’ll even say it: Happy Valentine’s Day!